Golf’s greatest technologies are lasting. SeeMore’s milled FGP is among those, as it has stood the test of time and generated over 20 PGA Tour wins, including the 1999 U.S. Open and the 2007 Masters. Remarkably, over 20 different players have used some version of the FGP to record top 10 finishes on the PGA Tour, leading to over $40 Million in earnings. The product was also used to set the all-time tour putting record over an entire season (1.699 Putts/GIR). The FGP has recorded PGA Tour wins in 1999, 2000, 2001, 2003, 2004, 2005, 2007, 2008, 2009, 2010, 2011, and 2012. Name another product on the PGA Tour where the same product was used by multiple winners over the course of 14 years. Beyond the great feel of the putter, there are some clear reasons on why players have performed so well with the FGP. First off, SeeMore Putters including the FGP feature RifleScope Technology (RST). SeeMore’s patented RST, known by a visible gun sight on the top line, allows the golfer to set up the putter perfectly each and every time in relation to the intended target line. This is accomplished by lining up the black bottom portion of the shaft between two white lines and covering a signature red dot on the heel of the top line. The process is like locking radar on a target. The two parallel white sight lines frame the shaft and serve as an indicator that the golfer is in perfect position to make a consistent and reliable stroke. The FGP, standing for “Featuring Ground Plumb” allows for the perfect rotation and release of the putter-head. The FGP is also Face-Balanced at impact, meaning that the toe weighting in this putter naturally wants to return to square at the impact position. The FGP will help the golfer establish consistent alignment, ball position, head position, hand position and loft on the putter, leading to a consistent stroke. SeeMore Putter Institute (SPi) instructors are communicating this message to their students. You can learn more about the process below. SeeMore has launched the SeeMore Putting system to golfers in the form of introducing the SeeMore Putter Institute (SPi), where golfers and instructors will be able to come together in person and online to share these fundamental ideas about how to improve putting performance. In its first year over 215 global instructors are utilizing SPi to generate more lessons, more revenue and more game improvement! SPi is a learning system based on the simple fundamentals of finding the proper grip, alignment, stance, and posture. This allows for a natural, free, and simple putting stroke on each and every putt. It is based on the technology built into the SeeMore putter itself, and on the refined teachings of SeeMore Global Ambassador Pat O’Brien – putting instructor to Zach Johnson, and many other top PGA Tour and developing players. O’Brien has been teaching the SeeMore System around the world for more than 12 years, ever since he watched his good friend, the late Payne Stewart benefit from the SeeMore putting system to win 1999 US Open and lead the tour in putting statistics that year. Becoming SPi Certified will help golf teachers formulate a complete teaching plan to help their existing students and recruit new students to become great putters using the SeeMore system that has won 2 Major Championships and set numerous putting records on the PGA Tour. It is a complete game plan, which will give any golf instructor a new level of confidence in the proper teaching and fitting involved in putting instruction. Becoming certified to teach the system initially consists of online training, but also includes personal coaching. SeeMore originally became recognized when Payne Stewart won the 1999 U.S. Open playing a SeeMore putter in the greatest final round putting performance in US Open History. The brand was re-launched in 2007, and immediately regained worldwide prominence as Zach Johnson used a SeeMore FGP to win the 2007 Masters. 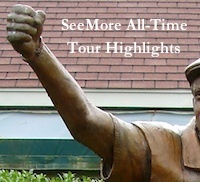 SeeMore’s website at www.seemore.com and www.seemorespi.com has many new features about SeeMore’s remarkable legacy, technology, and tour success. SeeMore putters are custom made in Franklin, TN.